Trencher - Reach It! - Move It! - Crush It! 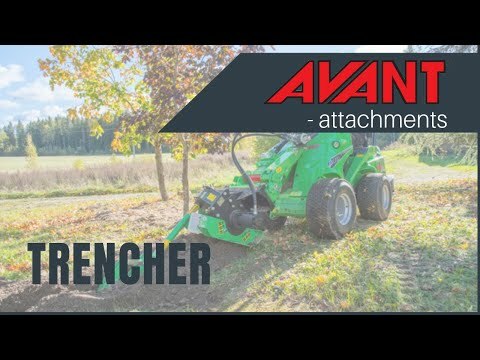 With Avant and trencher you can easily dig narrow trenches without damaging the ground on the digging area. The trencher does a clean trench which can easily be filled with a bucket or a dozer blade. Planetary drive with hydraulic motor guarantee powerful and trouble free operation. Digging depths are 900 and 1200 mm respectively, depending on model. Digging width is either 100, 150 or 200 mm, depending on the width of the trenching chain. Trencher chains have tungsten reinforcements to ensure long lasting performance in all soil conditions. Other models (chain width & digging depth) also available, please consult your local Avant distributor. Combination of an articulated Avant and trencher leaves almost no marks of digging operations after the work is done. This makes it a perfect solution for gardens and other lawn areas. Very fast and clean way to dig trenches for cables, drains, piping etc. Other models (chain width & digging depth) also available, please consult your local Avant distributor.